As of late, I have purchased several new additions to my firearms collection. The newest one is a 1960’s Ruger Single Six .22 cal revolver. Being a hunter, I have always felt that everyone needs a .22 pistol to take rabbits and grouse while hunting other game in the field. These tend to be targets of opportunity and by carrying a small pistol it makes harvesting this game much easier. This was the way I was taught and have lived my entire life of hunting, so having a .22 pistol was just a natural thing. My current .22 pistol is a Beretta Neos and I have carried it for quite a while. Both my father and my brother have Single Sixes so when I ran across this one at a fair price, I went ahead and snatched it up. The Ruger Single Six is a single action revolver that came with 2 cylinders. One was .22 lr and one was .22 mag. Used Single Sixes tend to have only the .22 lr cylinder due to the other one having been lost years before from lack of use. These pistols tend to be very accurate, are extremely tough and don’t really tend to have any mechanical issues so they are great carry pistols for small game. The older models are called 3 screws due to the 3 screws used on the frame. They tend to have great triggers and are fairly collectible. The early ones have a flat feed cover while the ones like I picked up have a rounded one. The flat ones are more collectible, but either way they are great users. Mine actually has the .22 mag cylinder with the .22 lr having been lost years before. Ironically, my brother’s is only 8000-ish numbers newer in serial number and has only the .22 lr. This brought me to looking around for a solution to my single cylinder problem. This is where I found an 8 shot cylinder solution from a very nice man names Al Story. While speaking with him on the phone he said that these are made for the newer Single Sixes, but with a little sanding/fitting they would work for the older ones as well. He also said that he checks each one for timing to ensure that they will work without issue. This is a very important piece because dealing with Ruger is a nightmare. I called Ruger’s customer service to ask about getting a new cylinder for my pistol. After being transferred a couple times a gentleman answered my call. I told him about my desire to get a new cylinder and asked him about pricing, process, and time frame. Here is what I found out. Ruger will not touch anyone’s older Single Six without installing a transfer bar and putting a HORRIBLE trigger into the pistol. For those that have fired a converted Single Six, you know exactly what I am talking about. The new ones are fine, but the older ones with the transfer bar installed no longer have the nice, smooth trigger. It catches and almost “clicks” when you pull it. If I do have the upgrade done, then it will cost $180 for the cylinder. There might be a discount if I send it in because of them wanting to “get all the old style pistols converted” because “in this day and age all guns have to be as safe as possible.” In another words, they will hold your pistol hostage until you agree to what I call a downgraded action. I will have to pay UPS or FedEx $100 to ship them the pistol. After some inquiry as to what he was talking about, he said that was some Federal law and I could get around it by paying Ruger $30 for a shipping label….. If they felt like offering that to me. I mentioned that S&W, Glock, and Colt pistols that I or my family have had to send back to the factory were covered by the manufacturer and I was very confused as to why Ruger would not cover those costs like other companies. He told me that they “might” cover the cost if they could get the pistol back to install the transfer bar, but I would probably have to go get the pistol shipped via UPS or FedEx at $100 cost to me. I then asked how timing worked and if they also did any reconditioning, checked out the pistol, or anything else for the $180 cylinder cost. I asked because I found the drop in ones from Al Story for only $120. He said that I could “buy one from another gun but I had less than a 10% chance of it working.” In reading reviews and speaking with Al, I beg to differ. I am not a gunsmith and have not tried an after market solution, however. If I go that route, I will update everyone. Ultimately, he was very dismissive and all conversations started off at a high priced solution that might get cheaper if I do “x” or “y.” This almost seemed like he was trying to gouge me for additional money throughout the entire process. This has been BY FAR the worst conversation I have ever had with a firearms manufacturer. Every other one has bent over backwards to make sure I was happy, so this almost seems out of place. Then I called my father and my brother. They both confirmed that dealing with Ruger has been a nightmare for them as well. Their suggestion was to get the Al Story cylinder and then have a gunsmith check it out. Although I have not taken this pistol out and fired it yet, I am very excited and have high hopes for it. The reputation of this pistol has always been impeccable, so buying it was really a no brainer. Once I get it all cleaned up, tested, and a new cylinder for .22 lr I will post some more on it. My final recommendation is as such. If and when you run into older pistols, make sure you research them. Don’t think that just because it is an older or discontinued style that it is no longer worth looking at. Some of the best users are those that have been used before. This entry was posted in Firearms and tagged .22 lr, .22 mag, 22 pistol, 22lr, Ruger, Ruger Single Six, Single Six, small game pistol on December 5, 2014 by Woodsbum. When was the last time you chatted with Al. I couldn’t find a date for your article. I noticed that in 2012′ he lost his firearms license. Has it been restored? I also have a single six revolver with a 22 Mag cylinder. 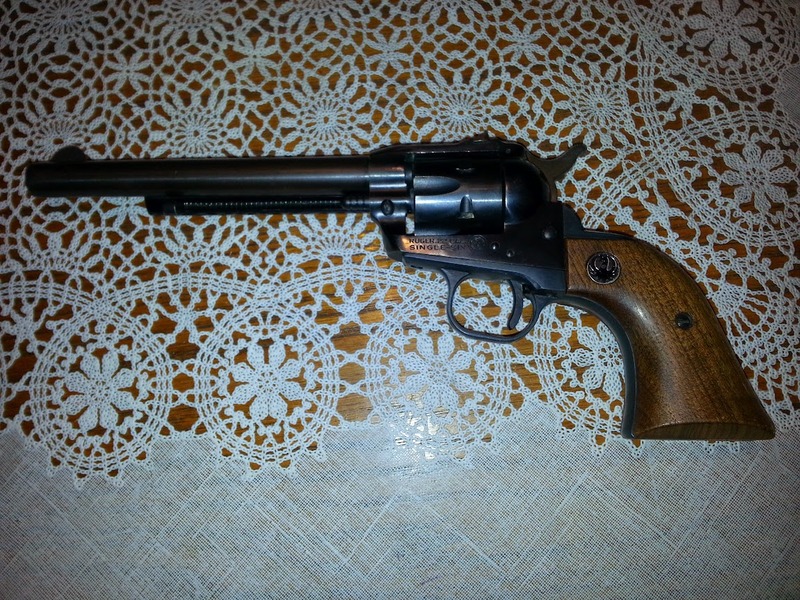 Somewhere in the 30 years I have had this revolver, I lost the 22LR cylinder. It sounds like Al might have the solution. Your feedback would greatly be appreciated, especially by e-mail if you can. Thank you. I spoke to him right before Christmas. He actually was the one that picked up the phone. Very nice guy. Once I get done paying off my .50 BMG I will get sending off to get the .22 lr cylinder.